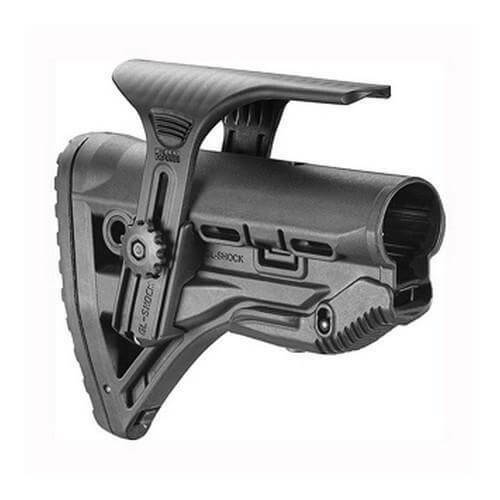 The first functional recoil-reducing collapsible stock for AR-15 carbines! – Reduces recoil and muzzle rise to allow faster, more accurate fire. – Provide comfort for 5.56 and large caliber M4/AR-15s, .308 AR-10s, and Mako shotgun kits. – 5 sling attachment points, including 2 QR attachment points. – Storage compartment for batteries or parts. – MIL-SPEC reinforced polymer composite, steel hardware, rubber buttpad. – Fits any weapon that accepts M-4/AR15 style stocks. – Patented system reduces recoil and muzzle rise. – Auto-tensioner for no-rattle fit on both mil-spec and commercial tubes! – Comfortable rubber buttpad provides traction on body armor. – Streamlined shape will not snag on gear. – Cheek riser is adjustable for optimal height for optics. I purchased this because I needed a high cheek rest to be comfortable. The stock.went on perfect, no wobble. Was comfortable and adjusted easily. The problem I had was that the cheek riser, when adjusted for my sight, interfered with my charging handle. If I had a red dot on top of my scope this would have been perfect. If you have a high profile scope then get this stock, just be sure the cheek riser clears the charging handle. Returned item and customer service was awesome. Will use AT3 Tactical again in the future.